Before I forget, I just wanted to mention that my blog was featured on the most recent Carnival of Homeschooling post over at No Fighting, No Biting. There are a lot of other really good posts mentioned on there as well that I've been checking out today that I hope you'll check out too! I think every public school parent I have added on Facebook is posting about Walmart's "Back to School" sale, the school supply list they got in the mail this week, or about taking their kids shopping for clothes or supplies. Everyone is beginning to plan for the upcoming school year. The same is true of us homeschool parents too, although in different ways. 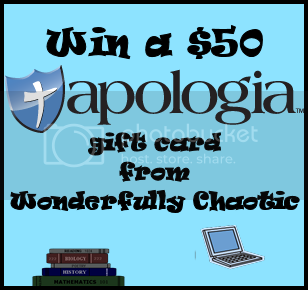 So to help you for whenever you do (sooner OR later) start planning for the coming year, I am giving away a $50 giftcard to Apologia! Apologia offers a wide variety of different products - homeschool planners, Elementary Science and Junior/Senior High Science curriculum, online classes, books about homeschooling, and more. I hope this will help you out! Check out the PunchTab box below to see more & enter! Chemistry and Physics - my oldest is doing chem this year and my first grader wants to "blow stuff up too!" I use all the science courses. I have this year's so I would probably buy ahead for next year for my younger girls- zoology. I'm planning to buy Exploring Creation with Chemistry and Physics. Probably purchase Human Anatomy curriculum. We have the Who Is God curriculum already, and I would like to get the Who Am I one. We are also using Apologia Botany this year, trying them out for the first time! I would get the Astronomy for my 1st/2n grader. Thank you for the giveaway. I am thinking Astronomy or Human Anatomy--both look awesome! My oldest wants to take anatomy, so the Human Body book would be the choice. I'm interested in purchasing planning materials. I would love to purchase the Jump In! two book set for reluctant writers! Thanks! Would get either Zoo 1, or Who Am I? the new chemistry and physics courses! I think I'd use it on the elementary botany,or astronomy or the Bible curriculum. I can't decide! We just love Apologia. I haven't decided what exact product, but it would be at the elementary level for my kiddos. Thanks for the giveaway! I would love to get the elementary zoology book. I would get the newest Young Explorers science books (the Chemistry & Physics). We love their worldview curriculum and the new elementary chemistry and physics looks fun too. We'd probably get Astronomy and Zoology 1. I would let my 4th grader pick an new notebooking journal for whatever he wants to study this year! I would get a planner and part of the science that we are studying for this year, Zoology 3. Any! We can't afford curriculum! Definitely want to get the next book in the Who Is God? series and the coloring books! I am interested in getting science texts for this coming year. We're still undecided between Anatomy and Swimming Creatures. I also have some books I'd love to get. I would love one of their planners. The new chemistry and physics for sure!!!! I would be blessed to have any from Apologia. But my children are going into General Science and Zoology 3. Two JR. Notebooks for anatomy! Thanks for the chance! I'd probably look for a planner. Zoology 1! Been wanting to try apologia! Astronomy Junior Journal and Notebooking Journal. Possibly the Zoology 2 textbook as well.